High energy density radiative transfer benchmark solutions are presented for a 1-D slab geometry using a three-temperature (electron, ion, and radiation) model and 1-D spherical geometry using a two-temperature (material, radiation) model. A transport model is used for the radiation, a conduction model is used for the electrons, and ion and/or material motion is assumed negligible. These benchmarks are useful in the verification and testing of simulation codes for laboratory astrophysics as well as high energy density physics (HEDP). The solutions require linearization of the coupled equations and are obtained via specific cubic functional forms (in temperatures) for the heat capacities and electron-ion coupling factor. These solutions are semi-analytic in that their exact forms can be written down, but 2-D integrals must be computed numerically for each point in space and time. 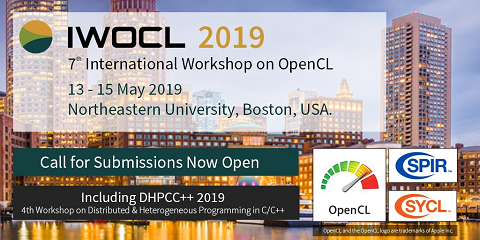 These integrals are slowly convergent and so a numerical integration routine was developed in OpenCL to take advantage of the high throughput that heterogeneous computing offers. Although capable of running on any OpenCL device, the nature of numerical integration meant GPUs were an excellent choice. Using a figure of merit analogous to flops per watt, the OpenCL implementation achieves 25x better performance with respect to this figure of merit, and an overall speedup of 560x was observed over a serialized implementation of the same algorithm.